In our latest installment of "Missing From" we asked Warner Robins natives Chris Davies and John Wilson of Middle Georgia Buzz, to recall the people, the places, sites and sounds of their home town. Warner Robins native and Barrel of Fun aficionado Amy Brown (NHS Class of 92′) recalling her totally awesome to the max youth, “The Barrel of Fun had a unique doorway, it was like you were walking into another world. It was every young person’s dream. Unlike today, it was a place where you could play the games but still have actual social interaction.” Sometimes I’d hit the games at the Putt-Putt but it was not quite the same. Putt-Putt culture is starkly different than Barrel of Fun culture. The Putt-Putt was way more California surfer and the Barrel of Fun was a refuge for the hoods, dorks and the marginalized of society. Recently, my search for redemption and lost youth brought me to back to the old Houston Mall. If you listen to the wind on a fall evening, the ringing of pinball machines from the Barrel of Fun DO indeed still echo 25 years later. On December 10, 1968 E. C. Lopez registered as the agent for Pepe’s Mexican Restaurant in Warner Robins. Over 47 years ago Pepe’s Mexican Foods, Inc quietly began. As a kid you could genuinely get excited to be at Pepe’s Mexican restaurant in the Zayre’s Shopping Center. The atmosphere was pure fiesta. It was the first time I thought eating out with adults was fun and where I fell in love with Salsa. What were your go-to menu items at Pepe’s? Cilantro was hard to find in Warner Robins back then. Someone told me they may have used chives. What did they use in their salsa? My big brother Joe’s initial reaction to hearing the bar’s name for the first time in decades? “I spent too much money there , I’m glad those days are over, THANK GOD ALMIGHTY !” You see, Brother Joe was a wild child but has since exited the highway to hell for a stairway to heaven. Back in the McGillicutty’s days Joe was a menace to society. In fact, one time he bought a brand new bullwhip. After whipping our tree in the backyard to hone his natural whipping skills, he came after Chris Davies. Chris was and still is our neighborhood’s Bart Simpson equivalent. Now Chris could really push Joe’s buttons and this was a showdown in the making. Legend has it he stopped at a local club for more libations and to challenge any man to a cage match. McGillicutty’s is rumored to be the location where Joe may have used a bullwhip in a bar fight and was crowned dual Champion* of both Warner Robins and Centerville. What are your McGillicutty’s memories? To this day, the name Biff Burger stirs up nostalgia for many who grew up in Warner Robins. Well times have changed but two original Biff Burgers still stand tall. 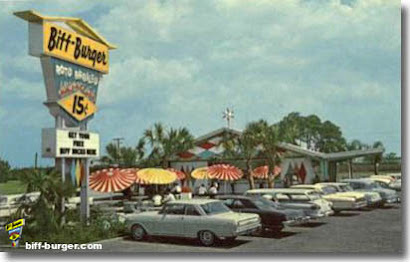 Can’t get a Biff Dog for .20¢ anymore but you can reach out and touch the past in St Petersburg, FL and Greensboro, NC. Road Trip! Biff Burger opened up on Watson Blvd and later moved to Byron at the intersection of hwy 41 and hwy 49. Certainly an unusual choice for a store location. However, the Byron store never opened even though construction was mostly complete. The giant Roto-Broiled sign still stands out front. So far, I’ve had two sources tell me the Byron location was rumored to be haunted. Is that why it never opened? 35 years later the building still sits as a ghostly reminder of the past and looks like the setting for a creepy slasher movie.